The Notcutts garden center chain has been helping gardeners since 1897. 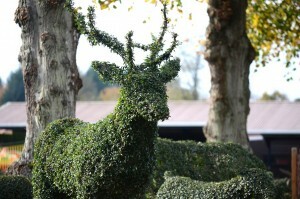 Looking to create a unifying topiary feature, to be used outside every one of their outlets, that would set them apart from other garden centers they came to Agrumi for design and fabrication advice. For this commission we suggested a tableau of British wildlife and created eighteen identical sets of figures including stags, foxes, hares and other common countryside animals – one tableau for every Notcutts centre. For this project we used Ligustrum delavayanum (box leaf privet) which is ideally suited to topiary work; so long as the client is prepared to wait a growing season for the greening-up process to fill any gaps. We also used this plant at Paultons Park and Peppa Pig World and whenever the sculptures are to be planted in the ground. The small leaf size in this Buxus lookalike means that we can sculpt fine definition into the wire armature frames that doesn’t get lost among the foliage. 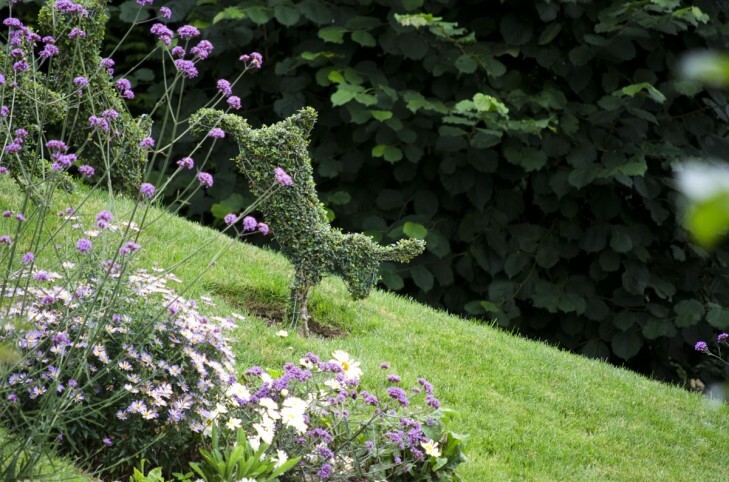 Notcutts’ Senior Plant Buyer said “We chose Agrumi for the quality, consistency and fine craftsmanship of their topiary sculptures, as well as their keen pricing. This British wildlife theme will have wide appeal both across generations in families and around the country”.